This non-dairy treat is a perfect way to cool down in the summer heat! 1. Mix the first three ingredients (cocoa powder, coconut oil, and Stevia) in a small dish. 2. Pour over waxed paper. 3. Place in the freezer for a few minutes until it completely hardens. 5. Store in the freezer until ready to use. 1. Blend everything but the raw chocolate chips in a blender. You can also use 1/2 tsp coffee grounds instead of the brewed coffee. 2. Pull your chocolate chips out of the freezer, make sure they are crumbled up small, and distribute them evenly between your popsicle molds. 3. 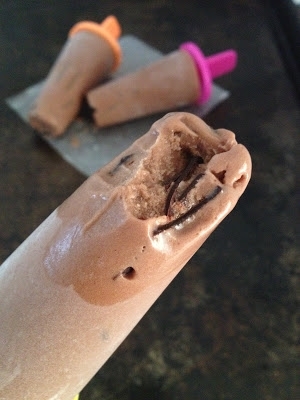 Pour your chocolate coconut milk mixture into the popsicle molds and freeze for at least 4-6 hours. If you don't have popsicle molds, get with it. Just kidding...just use dixie cups and little wooden popsicle sticks (place foil over the top of the cup and stick the stick through the foil so it stands up straight). Or be super OG and use plastic spoons if you don't have popsicle sticks. Whatever gets the job done!